Another method of frequency conversion is achieved by directly coupling the motor shaft to the generator shaft using a mechanical coupling, and adjusting the speed of the drive motor to vary the rotational speed of the generator, thus varying the output frequency. 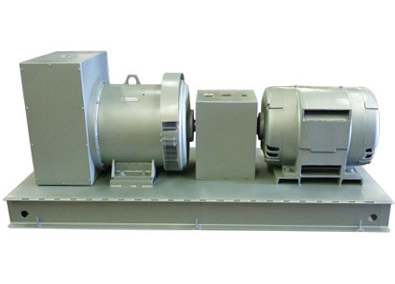 An adjustable speed electronic drive (ASD), also called a variable speed drive (VFD), is used for this purpose, instead of a conventional motor starter. This method also allows for the parallel operation of multiple frequency converters, using the ASD units to synchronize the outputs of the multiple motor generator sets.